Our image library and photo gallery provide you with photos of various events and people. 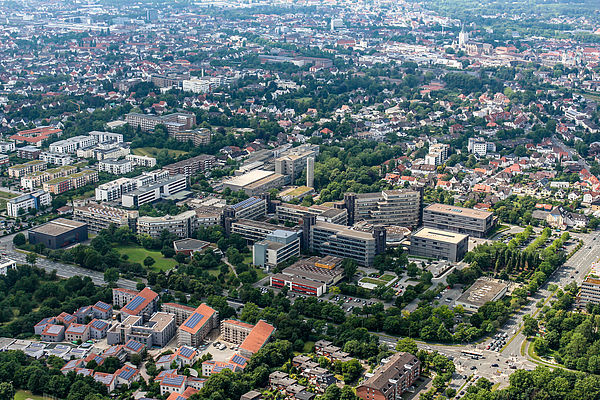 Here you can find desktop wallpapers of Paderborn University. Photo (Paderborn University, Johannes Pauly): Aerial view of Paderborn University in June 2018. Here you will find information on how to handle photo, video and audio recordings (in german). In particular, you will find information on image rights and the corresponding declaration of consent. Agreements to grant rights of use: photo, video and audio (in german). Here you can download an information document which you can print and place as a stand at events where photos are taken. Please note: DIN A1 is recommended for stands. Smaller variants will hardly be noticed. Here you can find the image library of Paderborn University. Here you will find desktop wallpapers of Paderborn University for your computer. In our photo gallery you will find photos of various events – from the AStA Summer Festival, Campus Run to Paderborn Science Days. Information about the corporate design and logo of Paderborn University.